This entry was posted on April 3, 2008 at 2:08 pm and is filed under Book of the Month, Books. You can follow any responses to this entry through the RSS 2.0 feed. You can leave a response, or trackback from your own site. I am not in the habit of reading your reviews because of the spoilers, however I do scroll down on each review to see your ratings to decide whether a book might be of interest to me. 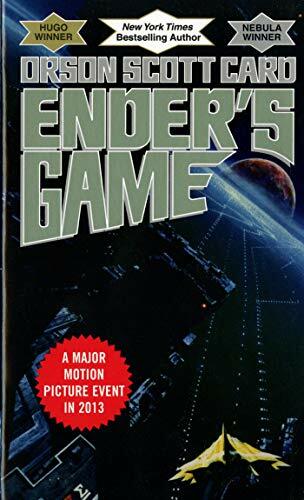 It was based on your ratings that I decided to read “Ender’s Game”. Admittedly, I had never even heard of Orson Scott Card before then. Overall, I thought the book was well written and entertaining. Like you have mentioned, the young ages of the children made it a little unbelievable. I, too, found myself adding years to the kids ages subconsciously. I also wondered on a few occasions why the adults could not find suitable commanders among adults. I did not fully accept why it was necessary to look for commanders and military personnel in six year old kids. I found the role of government in regards to population control and politics both intriguing and disturbing. The way they had managed to manipulate peoples’ attitudes toward the Thirds was creepy. I also found the government’s ability to acquire your children for their own uses equally troubling. I do have to admit, though. I did not see the twist ending about the simulations being real battles. I had bought the book a couple of months ago, and like I always do, read the back cover which should have spoiled it for me. However, by the time I got around to reading the book, I had forgotten what was written on the back. And sadly, when they said it would take 5 years for the fleet to reach the buggers, I believed them. Therefore, I believed the simulations were just that without question. Shame on me. I did like how the author handled Ender’s “redemption” and discovery about the buggers and their altered point of view about humans. However, that wasn’t enough to make me want to read any of the sequels. So I will just leave it at that for now. Maybe if you do a review of “Speaker for the Dead”, I might find reason to read it one day. I’m going to borrow you’re rating system here and give “Ender’s Game” 4 out of 5 running Steve’s. It was an enjoyable read, but it wasn’t enough to make me want to read more.